Do you have some great pictures of Baby Moose? Would you like to share them? Here's a chance for you to share some of those pictures you have taken. Moose calves are so cute and their pictures deserve to be shared for all to enjoy. It's easy! No Membership or Email Required! Just fill out the form below and post your pictures and stories. 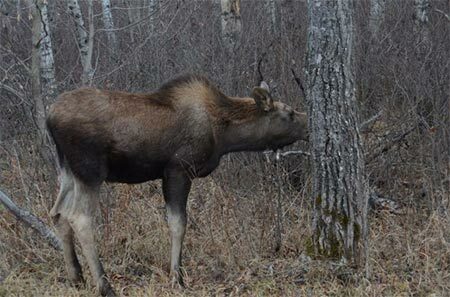 Please... if you have moose stories to go along with your pictures, do include them. It is always nice to have some sort of story to go along with calf moose pictures. During a recent visit to Babine Lake in Northern British Columbia we watched a cow moose and her two calves along the shallows of the lake. The calves ran and played in the water like a couple of children might play at the beach. I chuckled to myself as I watched because it was quite comical to view as they frolicked near the waters edge. Unfortunately... I was unprepared at the moment and did not take any pictures :-( It was was one of those moments that I will always regret. I am sure you have had those too! You know, where you had your camera but for some unknown reason you did not pull it out, therefore no candid shot; just the story to go along with it. I have resolved to use my camera more since that time, and I am sure glad I did. I have captured some great photos since then. Let me make a suggestion to you. You likely carry your camera with you on a lot of occasions... don't forget to use it. I found it helpful to pull my camera out a take some pictures as soon as we arrive somewhere, that way the picture taking can often be dispensed with early on. This also serves as a reminder to use my camera. Maybe one of you have great picture to go along with this little story? Your Best Baby Moose Pictures? Do you have some cute baby moose pictures? Share them here, tell the story that goes with them. Did you happen to go to Denali National Park, or maybe Yellowstone? Upload your best baby moose picture.